The Supreme Court has accepted certification from the District IV Court of Appeals of Rosecky v. Schissel, No. 2011AP2166. The Supreme Court will thus decide whether an agreement for the traditional surrogacy and adoption of a child is enforceable. In the case, a woman was artificially inseminated with the sperm from a friend. There was a written agreement that the baby would be raised by the friend and his wife. After birth, the mother reneged on the agreement and was granted visitation by the trial court. 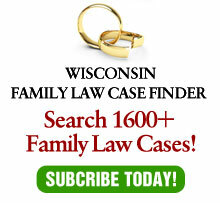 Wisconsin does not have any legislation or appellate law on surrogacy agreements so this case will have a great effect in that area of law. Should such agreements be honored? Should it matter if the mother is a traditional surrogate or not? I’ll provide further information and commentary on this case as it proceeds.